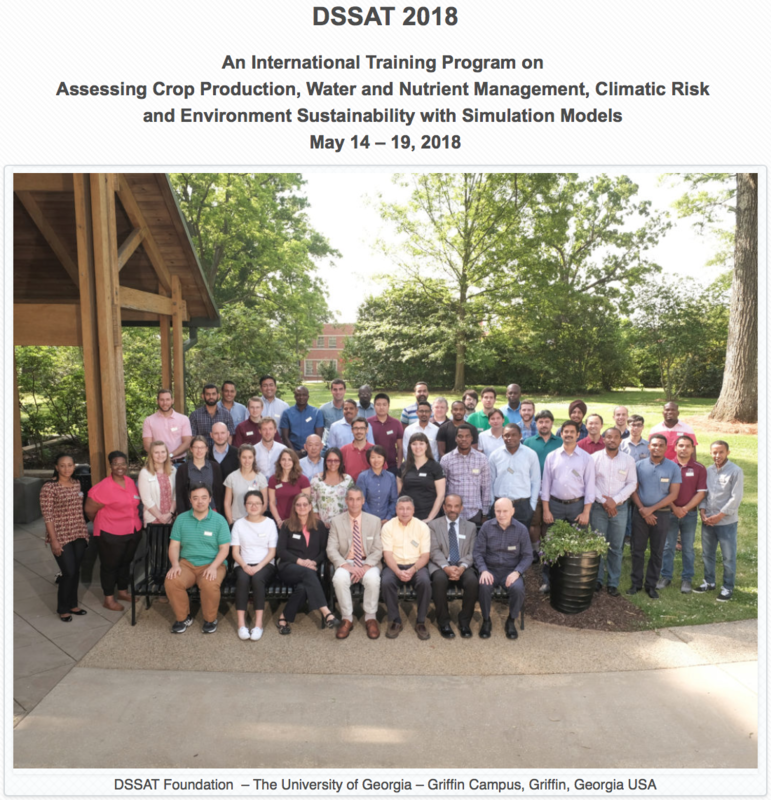 Agricultural scientists from across the world met on the University of Georgia Griffin Campus from May 14-19, 2018 to learn about the latest Version 4.7.2 of the DSSAT computer software program. The Decision Support System for Agrotechnology Transfer (DSSAT) helps researchers predict the growth and yield of various crops in response to the genetics, weather and management (G * E * M). Since 2004, scientists, graduate students, and many others have met on the campus in Griffin for the training. This year, the 47 participants represented Argentina, Brazil, Canada, China, Colombia, Costa Rica, Ecuador, France, Germany, Haiti, India, Italy, Jamaica, Japan, Nigeria, Senegal, Sri Lanka, Switzerland, Tanzania, Thailand, Togo, Turkey, the United Kingdom and the United States. DSSAT v4.7.5 is here. Request to download your own copy today! Feel free to drop us a message! Any feedback/comment is welcome. Hoogenboom, G., C.H. Porter, V. Shelia, K.J. Boote, U. Singh, J.W. White, L.A. Hunt, R. Ogoshi, J.I. Lizaso, J. Koo, S. Asseng, A. Singels, L.P. Moreno, and J.W. Jones. 2019. Decision Support System for Agrotechnology Transfer (DSSAT) Version 4.7.5 (https://DSSAT.net). DSSAT Foundation, Gainesville, Florida, USA. Jones, J.W., G. Hoogenboom, C.H. Porter, K.J. Boote, W.D. Batchelor, L.A. Hunt, P.W. Wilkens, U. Singh, A.J. Gijsman, and J.T. Ritchie. 2003. DSSAT Cropping System Model. European Journal of Agronomy 18:235-265.